The ascendance to power of the Aquino administration was the most significant event that took place in 2010. The marginalized sector particularly the workers were indeed hoping that the new government would somehow uplift their worsening conditions brought about by the global financial crisis. Unfortunately, the first half of the Aquino administration proved its real worth to the Filipino people in terms of its policies. The Aquino government only validated its subservience to the elite and not to the toiling masses. Unusual occurrence of strikes happened this year and the most glaring was the reaffirmation of the Aquino government to allow the Philippine Airlines (PAL) management to outsource its personnel and invoke the management prerogative as the basis of the dismissal of 2,600 employees. The breakfast forum was sponsored by the Partido Lakas ng Masa (PLM - Party of the Laboring Masses) every Monday where they invited Ms. Susan “Toots” Ople to enlighten on the challenges and prospects awaiting the labor sector in 2011. The fate of the workers for 2011 lies not on President Aquino’s hand but only for themselves, the emergence of the unprecedented labor unity as a result of the fight for the displaced airport employees is still alive and will further be bolstered by the numerous issues confronting the labor sector like the contractualization and other related concerns. “The Aquino government is yet to see the fury of the broad labor that is in store for next year. President Aquino is making a wrong signal for this year and can be faulted by the growing discontent of the Filipino workers. He must decisively address the problems of PAL and not just paying lip service to the needs of the Filipino workers.” Mr. Roni Luna, a leader in the CALABARZON Alliance, pointed out. This is the question posed by workers belonging to the Alliance of Progressive Labor (APL) who trooped to Mendiola today on the occasion of the celebration of the 147th birthday of the great proletarian hero Gat Andres Bonifacio. “We are getting concerned that the evolving economic policy of the Aquino government is no different from that of the previous government”, Josua Mata, APL Secretary General said. “Rather than alter a flawed economic policy that created years of jobless growth and declining real wages for the workers, it seems that the same market-oriented policies, a new guise, are being pursued,” the labor leader added. The APL chided the Aquino government’s flagship program, the Public-Private Partnership Program or PPPP, and its much-vaunted Conditional Cash Transfer program as severely inadequate in addressing the jobs crisis. Essentially, the PPPP is nothing but “BOT on steroids,” according to Mata. Build-operate-transfer schemes were implemented in the 1990’s to deepen and broaden privatization. After more than 2 decades of privatization, it is clear that these programs have failed to live up to its promises of improved and cost effective services. Instead, it has delivered large swatches of the economy to the hands of private oligopoly. At the same time, privatization, together with liberalization and deregulation, ushered years of jobless growth, precarious work and declining real wages. The APL finds the Conditional Cash Transfer, or CCT, necessary to contain poverty. “But CCT would only be successful if coupled with a robust jobs generation program,” Mata said. APL reiterated its call for the development of the local economy through agrarian and urban land reform, implementation of living wage and social protection, and the promotion of sustainable agriculture and industrialization. “We believe that all policies – monetary, fiscal, trade, investment, industrial, etc. – should be measured based on their efficiency in promoting secure and quality jobs for all,” Mata said. “While government has yet to show us the right path towards full employment, its ability to defend regular jobs still remains to be seen,” Mata added. APL is part of KONTRA, the broad coalition against contractualization, in pushing for the reversal of the DOLE’s decision on outsourcing in PAL. APL members also poured out into the streets of Naga, Cebu, Davao, General Santos, Cotabato and Cagayan de Oro to celebrate Bonifacio Day urging workers to struggle against neoliberal policies, end contractualization and fight for regular jobs. 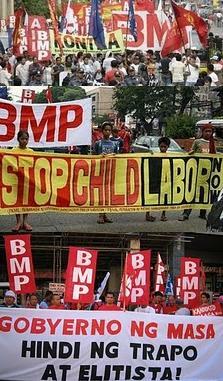 In the wake of the overwhelming vote for a strike by members of the Philippine Airlines Employees’ Association (PALEA), the militant Partido ng Manggagawa (PM - Workers Party) called on the House Labor Committee (LaborCom) to legislate restrictions on various contractualization schemes that have become widespread business practice. “Congress should read the writing on the wall. Contractualization is worsening the conditions of workers and is provoking labor unrest. It is high time to strictly regulate this pernicious practice that is subverting Constitutionally-guaranteed rights to security of tenure and freedom of self-organization,” stated Renato Magtubo, PM chair. PALEA members voted decisively in favor of a strike in balloting that started yesterday morning and ended at midnight. The LaborCom held a hearing this afternoon at the Batasang Pambansa on the various pending bills on security of tenure that was attended by labor leaders including officers of PALEA and PM. Later at 6:30 pm hundreds of PM and PALEA members and supporters trooped to the UP Diliman Film Center for the film screening of the indie movie “Endo” about the life of a temporary worker. “We further call on President Noynoy Aquino (PNoy) to make a policy statement by declaring the security of tenure bills as priority legislation and make a model out of the PAL case by striking a settlement that meets the demands of PALEA for job security,” Magtubo asserted. “The real aim of outsourcing and subcontracting is not efficiency and productivity. Its hidden agenda is to lessen labor costs and compete on the basis of cheap labor. The ulterior motive of contractualization is go around the protection for workers presently provided in the Labor Code such as the minimum wage, social security, employee benefits, separation pay and the freedom to have a voice and representation in the workplace through a union,” Magtubo argued. “Congress is mandated to enact laws that operationalize the mandate of the Constitution. The elegant phrases of the Constitution providing for protection to workers cannot be dead letters through inaction by solons. We ask them to expedite the passage of the pending bills,” Magtubo insisted. Accredited as the most militant labor group in 2010 as recorded in the DOLE (Department of Labor and Employment data, BMP (Bukluran ng Manggagawang Pilipino / Union of Filipino Workers) is geared for a challenging year in 2011. The group in a press conference called on the Aquino government to fulfill its promise to provide protection for the Filipino workers. “The recent intervention of the Aquino administration on the issue of Philippine Airlines is a welcome move. But the solution should go beyond the labor dispute but should be taken as a test case to review the policies which the government is inclined to promote. The problem of rampant of contractualization must be seriously addressed by the Aquino government. Long before the PAL issue, numerous cases of contractualization employed by most companies are already wreaking havoc on the lives of Filipino workers.” Mr. Leody De Guzman, BMP President explained. The likes of Gokongwei, Henry Sy, and many other big capitalists are in the same mold of Lucio Tan whose main concern is to streamline its business operations to cut cost and thereby sacrificing the benefits and welfare of the workers. The labor sector has been confronted by this problem even from the previous administration but ironically being pursued and sustained by the Aquino government. “We will not stop engaging the workers in various forms of struggles to put an end to the vicious cycle of contractualization. We have proven as provided for by this years’ data on strike that the workers are no longer apathetic but defiant of what they are experiencing and the broad labor is gaining grounds to foster strength and unity to fight contractualization.” Ronnie Luna, BMP Executive Vice President further elaborated. The group has lined various activities as part of their comprehensive caqmapaign and engagement to the Aquino government on the issue of contractualization. The group is set join the PALEA workers sponsored “Harana sa Mendiola” tomorrow at 10am. In the coming days, the group will also launch massive leafleting and related activities to kick off their various concrete and specific issues involving the evils of contractualization.